Kshar Sutra in modern days was invetented by Dr. Deshpande at IMS, BHU. Dr. SatyaRam was Reseach officer under Dr. Deshpande in the Kshar Sutra Project. Dr. SatyaRam has standarized the Kshar Sutra, deeply involved in treating the fistula in ano patients, preparing the reseach papers and reports of effectiveness of khsar sutra among the patients who were being treated. Additionally he has trained many doctors from India and from the abroad. Due to tireless effort of his team, WHO (World Health Organization) has approved the treatment of fistula in ano throgh Kshar Sutra also approved by Ministry of Health (Govt. of India). Kshar-Sutra has been proved as natural and non-operative permanent cure of fistula in Ano and due to its effectiveness Indian TV channel Doordarshan's scienece programme "TURNING POINT" has interviwed Dr. SatyaRam and aired this important cure to the people of India. 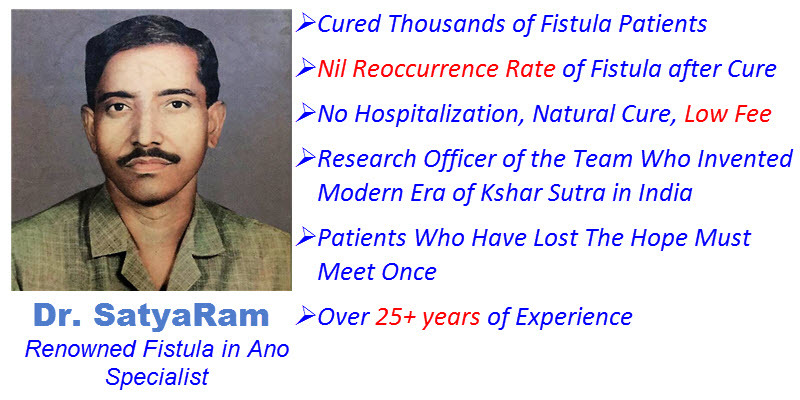 In his 25+ years of career Dr. SatyaRam has cured many patients who were lost their hope to get rid of this disease. Main issue with this disease is reoccurrance after cure by modern Medical science as its very difficult for modern medical science to remove fibrous tissues. Kshar does a nce job, it dissolves the hard & fibrous tissues from the fistuluous tract and also provides effective drainage to the absess cavity.